Welcome to my studio! I have been teaching for 20 years and have a passion for music whether it be in teaching, performing, or research. I hold a Master in Music from the University of Ottawa and an ARCT piano pedagogy diploma from the Royal Conservatory of Music. 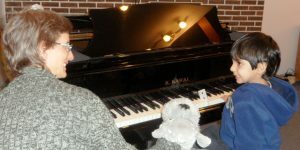 Students, from 5 years old and up, attend 32 weekly private piano lessons from September until May, and may begin at anytime during the year. Lessons are often available in spring and summer as well. 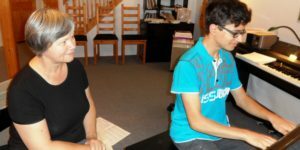 I teach both Suzuki and traditional methods, and prepare students for piano and theory exams. Please note that no more spaces are available for the year 2019-20. 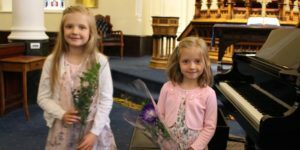 Children become members of the Piano Association of Ottawa/Gatineau and are invited to participate in recitals, group lessons, workshops and other events organized by the school. I am a teacher with the MusicLink Foundation which provides music lessons at a reduced cost. Parents are actively involved in their child’s musical education. Parents are asked to play the recording and to practice every day with their young child at home, and to come each week to lessons.